Hi Paula, ... I would also just like to take this opportunity of commending you and your team of doing such an efficient and proper medical,that was undertaken in an incredibly professional manner. You have a great team and excellent on-site service, and I will be sure to call upon yourselves for all the future projects that I will be working on. If you would like to find out more about your legal obligations or would like a quotation on our services, please feel free to contact us on 083 417 0044. 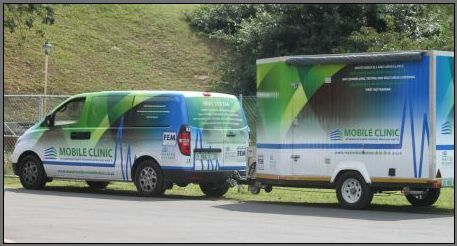 The Mobile Clinic has facilities to run a wide range of screening tests and examinations - all at your site. Medical Surveillance helps you protect their workers against health risks.